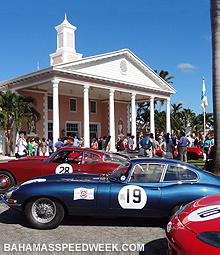 NASSAU, Bahamas, Oct. 23, 2012 /PRNewswire/ — Classic racing cars that once made the circuit at Le Mans or Sebring will make their way through the streets of Nassau Paradise Island for Bahamas Speed Week, Nov. 24 thru Dec. 2, 2012. A popular racing event in the 1950s and 1960s and revived in 2011, the 2nd annual Bahamas Speed Week features an expanded schedule of events that will again restore the glamour and competition of open-wheel racing in the destination’s capital. Vintage race cars with track records that include victories in some of the world’s most celebrated races and venues will once again make the circuit in Nassau. 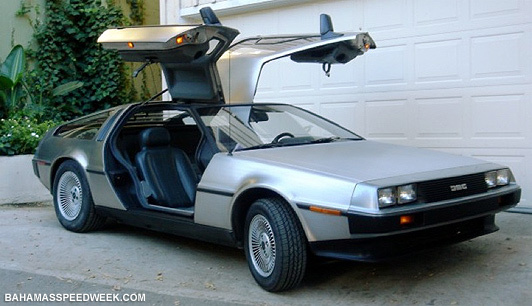 One of the more unusual cars coming to 2012 Bahamas Speed Week is an original, mint condition 1981 DeLorean, made famous in the Back to the Future trilogy. 375MM Pininfarina Spyder – The only remaining 1953 375MM Pininfarina Spyder still in original, unrestored condition will make its return to Nassau from the USA after a 57 year absence. Cooper Monaco – Raced by Jack Brabham in 1957 with glass splinters in his eye after his goggles shattered. Maserati Tipo 63 (Birdcage) – A screaming sports car powered by a V12 behind the driver. Ferrari 365 GTC – The elegant Ferrari 365 GTC sports a V12 power plant and is considered by many to be one of the favorite sports cars of all time. Mercedes 190 SL – A classic luxury racer scoring many victories in the 1950s. Mini Cooper 1275 S – Efficient engineering led to the Mini beating more powerful racers both at the track and on road-rallies in the 1960s. Led by International Motor Sports Hall-of-Famer and three-time Formula 5000 champion Brian Redman as Grand Marshal, the featured event of Bahamas Speed Week will be the official race on the Arawak Cay Circuit, where a paddock “car pit” pass is $75 and general entrance into the race is just $30. Want to enter a car in the event? The fleet of entries will depart from docks in West Palm Beach, Fla., and the logistics couldn’t be easier. Building on the success of 2011 revival, this year’s program has been expanded to include a Gala Concert, Auto Trade Show, Miss Speed Week Pageant, Beach Party and complimentary flights for Out Island Excursions. Popular returning events include the dinner at Graycliff Hotel & Cigar Factory, boasting the third largest privately owned wine cellar in the world; and a 007 island tour and lunch at Lyford Cay Golf Club, the exclusive neighborhood of Sir Sean Connery. Tickets to the events can be purchased individually at www.bahamasspeedweek.com. Spectators can also save up to $300 instantly on air-inclusive Speed Week travel packages booked by Nov. 12, 2012, which range from two to six nights. For more information and booking codes at Bahamas.com, click here. Life in the Islands Of The Bahamas just keeps getting better. And it’s easy to see why. With world-class diving and fishing, miles of picture perfect beaches, and gorgeous turquoise water, visitors have the opportunity to do everything or nothing at all. From Exuma, Eleuthera and Abaco to exciting Nassau/Paradise Island and Grand Bahama Island, this tropical paradise is as culturally diverse as it is vibrantly beautiful. For more information on travel packages, activities and accommodations, call 1-800-Bahamas or visit www.Bahamas.com. 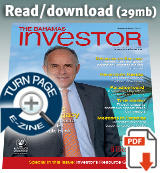 Join us on Facebook at www.facebook.com/travelbahamas. To purchase one-of-a-kind items and mementos from The Bahamas, visit www.eshopbahamas.com. The $409.5-million redevelopment of Lynden Pindling International Airport continued this month with the completion of the International and US Departure Gates and International Arrivals Terminal. Watch a ZNS news report on some of the Bahamian art featured in the new facility. Prime Minister Christie announced today that due to Hurricane Sandy all government and private schools and government offices will be closed tomorrow and Friday.